Latvia (historically Lattonia, Lettonia, or Lettland), officially the Republic of Latvia (Latvian: Latvija or Latvijas Republika), is a country in Northern Europe. Latvia shares land borders with Estonia to the north and Lithuania to the south – and both Russia and Belarus to the east. It is separated from Sweden in the west by the Baltic Sea. The famous "route from the Vikings to the Greeks" mentioned in ancient chronicles stretched from Scandinavia through Latvian territory via the River Daugava to the ancient Rus and Byzantine Empire. The ancient Balts of this time actively participated in the trading network. Across the European continent, Latvia's coast was known as a place for obtaining amber. Up to and into the Middle Ages amber was more valuable than gold in many places. Latvian amber was known in places as far away as Ancient Greece and the Roman Empire. The capital of Latvia is Riga. After the Cold War and dissolution of the Soviet Union, Latvia flexed its freedom and became a member state of the European Union on the former Socialist Republics holiday May 1, 2004. Located between 55.40 and 58.05 latitude and 20.58 and 28.14 longitude, Latvia lies on the eastern shores of the Baltic Sea on the level northwestern part of the rising East European Plain, between Estonia and Lithuania. 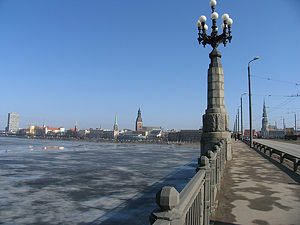 An inlet of the Baltic Sea, the shallow Gulf of Riga is situated in the northwest of the country. Latvia's coastline extends for 330 miles (531 kilometers). About 98 percent of the country lies under 640 feet (200 m) elevation. The damp climate resembles the U.S. region of New England. 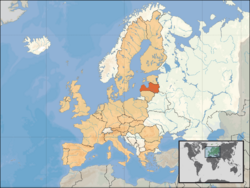 At 24,937 square miles (64,589 sq km), Latvia is slightly larger than Denmark, Estonia, the Netherlands, or Switzerland. It shares borders with Estonia to the north (166 mi or 267 km), Lithuania to the south (282 mi or 453 km), Belarus on the southeast (88 mi or 141 kilometers), and Russia on the east (135 mi or 217 km). Prior to World War II, Latvia bordered eastern Poland, but as a result of boundary changes by the Soviet Union, this territory was attached to Belorussia. Also, in 1944 Russia annexed the northeastern border district of Latvia, known as Abrene (about 6 percent of its territory), including the town of Pytalovo. With the exception of the coastal plains, the ice age divided Latvia into three main regions: the morainic Western and Eastern uplands and the Middle lowlands. Latvia has over 12,000 rivers, only 17 of which are longer than 60 miles (about 100 km), and over 3,000 small lakes, most of which are eutrophic. The major rivers include the Daugava, the Lielupe, the Gauja, and the Salaca. Woodlands, more than half of which are pine forests, cover around 41 percent of the country. Other than peat, dolomite, and limestone, natural resources are scarce. Latvia has 329 miles (531 kilometers) of sandy coastline, and the ports of Liepaja and Ventspils provide important warm-water harbors for the Baltic coast. Across Europe, Latvia's coast was famous for its amber. The ancient Balts traded Latvian amber with Ancient Greece and the Roman Empire. By 900 C.E., four Baltic tribal cultures had developed: Couronians, Latgallians, Selonians, Semigallians (in Latvian: kurši, latgaļi, sēļi and zemgaļi). At the end of the 1100s, Latvia was often visited by traders from western Europe who set out on trading journeys along Latvia's longest river, the Daugava, to Russia. In 1180, Christian missionaries arrived. As the Balts did not readily convert and opposed the ritual of christening, German Crusaders were sent into Latvia to convert the pagan population. By 1211, the foundation for the Dome Cathedral in Riga was laid, symbolizing the success of Christianity's control. In the 1200s, a confederation of feudal nations called Livonia developed under German rule. Livonia included today's Latvia and Southern Estonia. In 1282, Rīga and later the cities of Cēsis, Limbaži, Koknese and Valmiera were included in the Hanseatic League, an association of German and other Baltic states merchants. From this time, because of its central location in the Eastern Baltic region, Riga became an important point in west-east trading, forging close cultural contacts with Western Europe. The 1500s were a time of great changes for the inhabitants of Latvia, notable for the reformation and the collapse of the Livonian nation. After the Livonian War (1558-1583) today's Latvian territory came under Polish-Lithuanian rule. The Lutheran faith was accepted in Kurzeme, Zemgale, and Vidzeme, but the Roman Catholic faith maintained its dominance in Latgale and continues to do so today. The seventeenth and early eighteenth centuries brought a struggle between Poland, Sweden, and Russia for supremacy in the eastern Baltic. Most of Polish Livonia, including Vidzeme, came under Swedish rule with the Truce of Altmark in 1629. Under the Swedish rule serfdom was eased and a network of schools was established for the peasantry. The Treaty of Nystad, ending the Great Northern War in 1721, gave Vidzeme to Russia (it became part of the Riga Governorate). The Latgale region remained part of Poland as Inflanty until 1772, when it was joined to Russia. The Duchy of Courland became a Russian province (the Courland Governorate) in 1795, bringing all of what is now Latvia into Imperial Russia. The promises Peter the Great made to the Baltic German nobility at the fall of Riga in 1710, confirmed by the Treaty of Nystad and known as "the Capitulations," largely reversed the Swedish reforms. The emancipation of the serfs took place in Courland in 1817 and in Vidzeme in 1819. In practice, the emancipation was actually advantageous to the nobility because it effectively dispossessed the peasants of their land without compensation. The social structure changed dramatically, with a class of independent farmers establishing itself after reforms allowed the peasants to repurchase their land, landless peasants numbering 591,000 in 1897, a growing urban proletariat, and an increasingly influential Latvian bourgeoisie. The Young Latvians movement laid the groundwork for nationalism from the middle of the nineteenth century with many of its leaders looking to the Slavophiles for support against the prevailing German-dominated social order. Russification began in Latgale after the 1863 January Uprising and spread to the rest of what is now Latvia by the 1880s. The Young Latvians were largely eclipsed by the New Current, a broad leftist social and political movement, in the 1890s. Popular discontent exploded in the 1905 Revolution, which took on a nationalist character in the Baltic provinces. Riga Skyline from Bridge over Daugava. World War I devastated the country. Demands for self-determination were at first confined to autonomy, but full independence was proclaimed in Riga on November 18, 1918, by the People's Council of Latvia. Kārlis Ulmanis became the head of the provisional government. A War of Independence followed the November declaration and led to a very chaotic period in Latvia's history. By the spring of 1919 there were actually three governments - Ulmanis' government; the Iskolat led by Pēteris Stučka, which proclaimed an independent Soviet Latvia and whose forces, supported by the Red Army, occupied almost all of the country; and the Baltic German government of the "Baltic Duchy" headed by Andrievs Niedra. Estonian and Latvian forces defeated the Germans at the Battle of Cēsis in June 1919, and a massive attack by a German and Russian force under Pavel Bermondt-Avalov was repelled in November. Eastern Latvia was cleared of Red Army forces by Polish, Latvian, and German troops in early 1920. A freely elected Constituent Assembly was convened on May 1, 1920 and adopted a liberal constitution, the Satversme, in February 1922. This was partly suspended by Ulmanis after his coup in 1934, but reaffirmed in 1990. Since then it has been amended and is the constitution of Latvia today. With most of Latvia's industrial base relocated to the interior of Russia in 1915, radical land reform was the central political question for the young state. In 1897, 61.2 percent of the rural population had been landless; by 1930 that percentage had been reduced to 23.2 percent. The extent of cultivated land surpassed the pre-war level by 1923. Innovation and rising productivity led to rapid growth of the economy, but it soon suffered the effects of the Great Depression. Though Latvia showed signs of economic recovery and the electorate had moved steadily toward the center during the parliamentary period, Ulmanis staged a bloodless coup on May 15, 1934, establishing a nationalist dictatorship that lasted until 1940. Most of the Baltic Germans left Latvia by agreement between Ulmanis' government and Nazi Germany after the conclusion of the Molotov-Ribbentrop Pact. On October 5, 1939, Latvia was forced to accept a "mutual assistance" pact with the Soviet Union, granting the Soviets the right to station 25,000 troops on Latvian territory. On June 16, 1940, Vyacheslav Molotov presented the Latvian representative in Moscow with an ultimatum accusing Latvia of violations of that pact, and so, on June 17, great numbers of Soviet forces occupied the country. Fraudulent  elections for a "People's Saeima" were held, and a puppet government headed by Augusts Kirhenšteins brought Latvia into the USSR. The annexation was formalized on August 5, 1940. The Soviets dealt with their opponents prior to the German invasion in less than a year. At least 27,586 persons were arrested; most were deported, and at least 945 persons were executed. While under German occupation, Latvia was administered as part of Reichskommissariat Ostland. Latvian paramilitary and Auxiliary Police units established by occupation authority actively participated in the Holocaust. More than 200,000 Latvian citizens died during World War II, including approximately 70,000 Latvian Jews murdered during the Nazi occupation. Latvian soldiers fought on both sides of the conflict, including in the Latvian Legion of the Waffen-SS, most of them conscripted by the occupying Nazi and Soviet authorities. Refusal to join the occupying army resulted in an imprisonment, threats to relatives, or even death. The Soviets reoccupied the country in 1944-1945, and further mass deportations followed as the country was forcibly collectivized and Sovietized; 42,975 persons were deported in 1949. An influx of laborers, administrators, military personnel and their dependents from Russia and other Soviet republics started and by 1959, the ethnic Latvian population had fallen to 62 percent. During the Khrushchev Thaw, attempts by national communists, led by Eduards Berklavs, to gain a degree of autonomy for the republic and protect the rapidly deteriorating position of the Latvian language were suppressed. In 1989, the Supreme Soviet of the USSR adopted a resolution on the "Occupation of the Baltic States," in which it declared that the occupation was "not in accordance with law," and not the "will of the Soviet people." A national movement coalescing in the Popular Front of Latvia took advantage of glasnost under Mikhail Gorbachev, opposed by the Interfront, and on May 4, 1990, the Supreme Soviet of the Latvian SSR adopted the Declaration of the Restoration of Independence of the Republic of Latvia, subject to a transition period that culminated with Latvian independence on August 21, 1991, after the failure of the August Putsch in Moscow. The Saeima, Latvia's parliament, was again elected in 1993, and Russia completed its military withdrawal in 1994. The major goals of Latvia in the 1990s, to join NATO and European Union, were achieved in 2004. Language and citizenship laws have been opposed by many Russophones (Latvian is the official language and citizenship was not automatically extended to some former Soviet citizens - mostly ethnically Russian - who settled during the occupation, or to their descendants). The government denationalized private property confiscated by the Soviet rule, returning it or compensating the owners for it, and privatized most state-owned industries. The prewar currency was reintroduced. After a difficult transition to a liberal economy and its re-orientation toward Western Europe, Latvia still has one of the lowest standards of living in the European Union, though its economy has one of the highest growth rates. The 100-seat unicameral Latvian parliament, the Saeima, is elected by direct, popular vote every four years. The president is elected by the Saeima in a separate election also every four years. The president appoints a prime minister who, together with his cabinet, forms the executive branch of the government, subject to a confidence vote by the Saeima. This system also existed before Second World War. In a nationwide referendum on September 20, 2003, 66.9 percent of those taking part voted in favor of joining the European Union. Latvia became a full-fledged member of the EU on May 1, 2004. Latvia has been a NATO member since March 29, 2004. Although membership in the EU and NATO were the major goals of Latvia through the 1990s, Latvian politicians today are often criticized for being unable to benefit from Latvia's membership. Latvia is divided in 26 counties and 7 municipalities*: Aizkraukles Rajons, Aluksnes Rajons, Balvu Rajons, Bauskas Rajons, Cesu Rajons, Daugavpils*, Daugavpils Rajons, Dobeles Rajons, Gulbenes Rajons, Jekabpils Rajons, Jelgava*, Jelgavas Rajons, Jurmala*, Kraslavas Rajons, Kuldigas Rajons, Liepaja*, Liepajas Rajons, Limbazu Rajons, Ludzas Rajons, Madonas Rajons, Ogres Rajons, Preilu Rajons, Rezekne*, Rezeknes Rajons, Riga*, Rigas Rajons, Saldus Rajons, Talsu Rajons, Tukuma Rajons, Valkas Rajons, Valmieras Rajons, Ventspils*, Ventspils Rajons. Latvia is also historically, culturally and constitutionally divided into four or more distinct regions. Today's Republic of Latvia regards itself as a continuation of the 1918-1940 republic. After the declaration on the restoration of its full independence on August 21, 1991, Latvia became a member of the United Nations on September 17, 1991, and is a signatory to a number of UN organizations and other international agreements, including COE, IAEA, CERCO, ICES, ICAO, IAEA, UNESCO, UNICEF, IMF, ICC, and WB/EBRD. It also is a member of the Organization for Security and Coöperation in Europe (OSCE) and of the North Atlantic Coordinating Council. Latvia maintains embassies in the United States, Austria, Belarus, Belgium, Canada, the People's Republic of China, the Czech Republic, Denmark, Estonia, Finland, France, Germany, Greece, Israel, Italy, Lithuania, Netherlands, Norway, Poland, Portugal, Russia, South Africa, Sweden, Ukraine, the United Kingdom, and Uzbekistan. It also operates missions to the United Nations in New York City and Geneva, the European Council, and non-member representation to the European Union, Chemical Weapons Nonproliferation Organization, the OSCE, NATO, World Trade Organization, and the UN Council on Food and Agriculture. Latvia has had strained relations with the Russian Federation due to Russian discontent with the impact of Latvian language and citizenship policies on the 32 percent of the Latvian population that is Russian (as of the 2000 census). Latvia's request for Russia to recognize it as continuous with the first Latvian Republic and acknowledge consequences of Soviet occupation is an additional point of contention. In turn, Latvia is interested in the welfare of ethnic Latvians still residing in Russia. The latest Russian census shows about 40,000 still living in Russia, but sources indicate that given the probability of an undercount, Latvians in Russia probably number about 50,000-60,000. As of 2007, however, Latvia's relationship with Russia seems to be improving. Twenty-first century Latvia is a member of the World Trade Organization (1999) and the European Union (2004). On January 1, 2014, the Euro became the country's currency, superseding the Lats. Privatization in Latvia is almost complete. Virtually all of the previously state-owned small and medium companies have been privatized, leaving only a small number of politically sensitive large state companies. The economic crisis of 2009 proved earlier assumptions that the fast-growing economy was heading for implosion of the economic bubble, because it was driven mainly by growth of domestic consumption, financed by a serious increase of private debt, as well as a negative foreign trade balance. The prices of real estate were long perceived to be too high for the economy, which mainly produces low-value goods and raw materials. The Latvian economy entered a phase of fiscal contraction during the second half of 2008 after an extended period of credit-based speculation and unrealistic appreciation in real estate values. However, by 2010 there were noted signs of stabilization in the Latvian economy. The IMF concluded the First Post-Program Monitoring Discussions with the Republic of Latvia in July 2012 announcing that Latvia's economy has been recovering strongly since 2010. Real GDP growth of 5.5 percent in 2011 was underpinned by export growth and a recovery in domestic demand. The growth momentum continued into 2012 and 2013 despite deteriorating external conditions. The unemployment rate receded from its peak of more than 20 percent in 2010 to around 9.3 percent in 2014. Latvia's population has been multiethnic for centuries, though the demographics shifted dramatically in the twentieth century due to the world wars, the emigration and removal of Baltic Germans, the Holocaust, and occupation by the Soviet Union. Latvians and Livonians, the indigenous peoples of Latvia, now form about 60 percent of the population; around 25 percent are Russian. Approximately 54 percent of the ethnic Russians living in Latvia are citizens of Latvia. People who arrived while Latvia was occupied by the USSR and their descendants born before 1991 must be naturalized to receive Latvian citizenship. In some large cities such as Daugavpils and Rēzekne, Russians and other minorities outnumber Latvians. Minorities from other countries such as Belarus, Ukraine, Poland, and Lithuania also live in Latvia. The official language of Latvia is Latvian, part of the Baltic language group of the Indo-European language family. Another notable language of Latvia is the nearly extinct Livonian language, a Baltic-Finnic subbranch of the Uralic language family, that enjoys protection by law. Latgalian language - a dialect of Latvian - is also protected by Latvian law as a historical variation of Latvian language. Russian is by far the most widespread minority language, spoken, or at least understood, by large sections of the non-Russian population. The population is mostly Christian, the largest group being Lutheran (34 percent of total population), with smaller percentages of Roman Catholic (24 percent) and Eastern Orthodox (18 percent). There are also Jews (9,883 in 2005) in Latvia who are, for the most part, a remnant of the former population. According to the last official census of 1935, there were 93,479 Jews living in Latvia, representing about 5 percent of the population. During World War II the Jewish community was mostly killed. Officially, there are roughly 300 Muslims living in Latvia; the total number of Muslims in Latvia, however, is estimated to be much higher. About 20 percent of the total population is not affiliated with a specific religion. A knight of the The Livonian Brothers of the Sword. Between the thirteenth and nineteenth century, Baltic Germans, many of whom were originally of non-German ancestry but had been assimilated into German culture, formed the upper class. They developed a distinct cultural heritage, characterized by both Latvian and Russian influences, which has survived in German Baltic families to this day, in spite of their dispersal to Germany, the USA, Canada and other countries in the early twentieth century. However, most indigenous Latvians did not participate in this particular cultural life. Thus the mostly peasant local pagan heritage was preserved, partly merging with Christian traditions. For example, one of the most popular celebrations today is the midsummer festival, or Jāņi, a paganic celebration of the summer solstice, celebrated on the feast day of Saint John the Baptist. Wishing for a “Latvian Latvia” for his people, the archeologist Ernests Brastiņš (1892-1942) turned to this inheritance of folk songs and was the first to devote himself to the wide and systematic research of Latvian religion. In the 1920s, together with his acquaintances, Brastiņš laid the foundation for dievturība, which is the renewed ancient Latvian religion. After incorporation into the USSR, Latvian artists and writers had to follow the Socialist realism style of art. During the Soviet era, music became increasingly popular. Songs often made fun of the characteristics of Soviet life and were concerned about preserving Latvian identity. This aroused popular protests against the USSR and also gave rise to an increasing popularity of poetry. Since independence, theatre and scenography have become the most notable branches of Latvian culture. ↑ 1.0 1.1 Social Statistics Department of Latvia, Latvijas iedzīvotāju etniskais sastāvs Social Statistics Department of Latvia. Retrieved June 29, 2018. ↑ History Embassy of Finland, Riga. Retrieved June 29, 2018. ↑ The number of population is decreasing – the mark has dropped below 2 million Central Statistical Bureau of Latvia, June 6, 2014. Retrieved June 29, 2018. ↑ Population Census 2011 – Key Indicators Central Statistical Bureau of Latvia, March 10, 2013. Retrieved June 29, 2018. ↑ 5.0 5.1 5.2 5.3 International Monetary Fund, Latvia Report for Selected Countries and Subjects. Retrieved June 29, 2018. ↑ Gini coefficient of equivalised disposable income - EU-SILC survey Eurostat Data Explorer. Retrieved June 29, 2018. ↑ Jaunumi, (in Latvian only) Retrieved June 29, 2018. ↑ Data: 3000 B.C.E. to 1500 B.C.E., The Ethnohistory Project. Retrieved June 29, 2018. ↑ Election "results" were issued early by the Soviet press service. They were published subsequently in the news in London 24 hours before the polls closed. 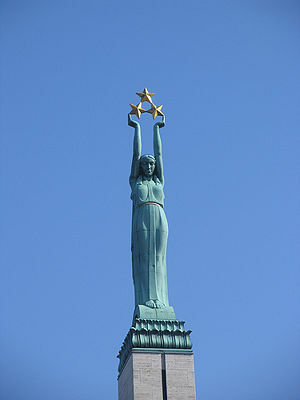 ↑ Latvia:Economy, Historical Legacy, U.S. Library of Congress Country Studies. Retrieved June 29, 2018. ↑ Growth rate of real GDP per capita Eurostat. Retrieved June 29, 2018. ↑ Nina Kolyako, Rimsevics: Failing to bail out Parex banka would result in closing down of four banks in Latvia The Baltic Course, December 30, 2009. Retrieved June 29, 2018. ↑ Latvian economy in rapid decline BBC News, May 11, 2009. Retrieved June 29, 2018. ↑ Public Information Notice (PIN) No. 12/76 by IMF IMF Executive Board Concludes First Post-Program Monitoring Discussions with the Republic of Latvia, International Monetary Fund, July 16, 2012. Retrieved June 29, 2018. ↑ Statistics of approved parishes in Latvia, Latvian Religious Encyclopedia. Retrieved June 29, 2018. ↑ Amanda Jātniece, A primer on the Latvian folk religion Latviansonline, December 7, 2004. Retrieved June 29, 2018. Iwaskiw, Walter R. (ed.). Latvia: A Country Study. Washington: GPO for the Library of Congress, 1995. Latviešu nacionālais fonds. These names accuse; nominal list of Latvians deported to Soviet Russia in 1940-41, 1951. Rutkis, Jānis, and V. Kreicbergs. Latvia: country and people. Stockholm: Latvian National Foundation, 1967. Švābe, Arveds. The story of Latvia and her neighbours, a historical survey. Edinburgh: Scottish League for European Freedom, 1947. This page was last modified on 29 June 2018, at 20:13.